Mirrors are popular additions to outdoor landscaping. Acrylic mirrors are designed to provide weatherproof reflection out of the box. 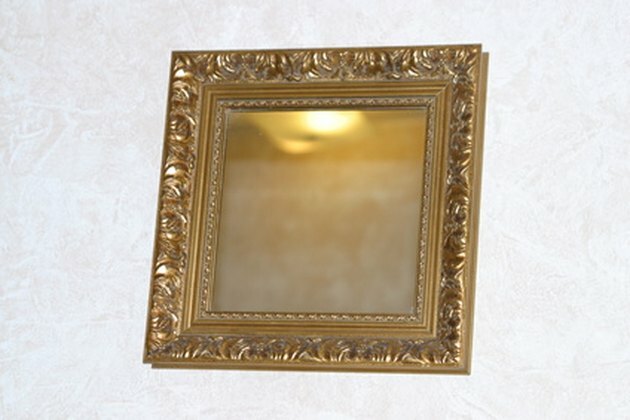 However, if you desire a non-acrylic mirror that will better stand up to scratches, you will need to seal its edges. This will weatherproof the mirror and will protect it from rusting and developing a black edge from constant exposure to the elements. Weatherproof your mirror with an edge sealant. Purchase a mirror edge sealer from a hardware store or glass distributor. These sealers are available online as well. They protect mirror edges from blackening, which is often caused by exposure to weather such as rain, snow, sleet and ice. Sealers protect mirrors from moisture as well as from cleaning materials, salt in the air in beachfront locations, and chemical fumes. They are easy to apply and are usually come as pressurized sprays with self-applicator mechanisms. Sealers typically go on yellow or clear, and they always dry clear. These sealants also prevent moisture from getting between the mirror and its backing; such moisture eventually would damage the mirror. Gunther, Sprayway and CRL are popular brands of mirror edge sealer. Prepare your work area. In an outdoor, well-ventilated location, lay out a blanket or tarp that is larger than the mirror you are going to seal. Lay the mirror down on top of the tarp. Choose a mild day, free of heavy precipitation, to seal your mirror. Apply the mirror edge sealer to the mirror. Using a wide-edge brush, which will most likely be included with your sealer, spread the sealer around the edges of your mirror. If you purchased a spray, apply the sealer by spraying to every surface edge of the mirror. Hold the can the proper distance from the mirror (usually six to 12 inches from the surface) and deliver a steady stream of sealant to the mirror. Never point the can toward you. Wear gloves to protect your hands from having any sealant applied accidentally to them. Allow the mirror to completely dry. Let it sit on the tarp for two to three hours. Then, using an old washcloth or soft towel and denatured alcohol or glass cleaner, clean any visible sealant off the mirror's viewing surface. Why Does a Bathroom Mirror Turn Misty After a Shower?